The OMNI-AMP I model has been discontinued. Please see the OMNI-AMP IV as a possible alternative or contact our Temperature Engineering Department. 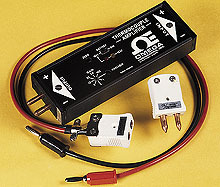 OMEGA'S® portable thermocouple signal amplifier is designed to multiply small voltage signals. The output can be used directly by most readouts, such as panel meters, strip chart and x-y recorders, multimeters, multiplexers, and for input to control systems. Minute thermocouple output signals can be multiplied up to 100 times to drive meters or instruments which otherwise are not sensitive enough to be driven directly by the small output voltage of a thermocouple. This small, compact, completely self-contained high gain amplifier can be instantly employed in a thermocouple circuit either at the thermocouple or at the readout device having 1000 ohms or greater input impedance. This small and powerful amplifier can be used with all thermocouple alloy combinations to boost output voltage. It can be placed directly at the thermocouple element output quick-disconnect jack or anywhere in the circuit between the thermocouple and the readout device. It is intended primarily for use with inexpensive moving coil meter devices.